Your inner history buff will appreciate The Rocks and Museum of Sydney. 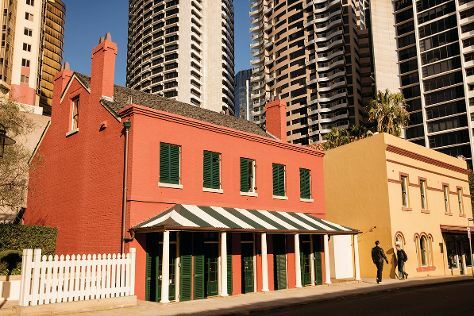 You'll explore and learn at Australian National Maritime Museum and Hyde Park Barracks Museum. Get out of town with these interesting Sydney side-trips: Blackheath (Logan Brae Orchard & Squirrel Shop), Katoomba (Katoomba Antique Centre, Wentworth Falls, & more) and Royal National Park (Karloo Pools & Figure 8 Pools). Spend the 20th (Wed) wandering through the wild on a nature and wildlife tour. Spend the 12th (Fri) exploring nature at Berowra Valley National Park. There's still lots to do: enjoy some music at Sydney Opera House, admire the masterpieces at Art Gallery of New South Wales, wander the streets of Darling Harbour, and look for all kinds of wild species at Muogamarra Nature Reserve. To find ratings, maps, traveler tips, and more tourist information, read Sydney travel route planner. If you are flying in from United States, the closest major airport is Sydney Kingsford Smith International Airport. March in Sydney sees daily highs of 79°F and lows of 66°F at night. Finish your sightseeing early on the 23rd (Tue) to allow enough time to travel back home.